London—Pace London is delighted to present How long is now, Brent Wadden’s first solo exhibition in the United Kingdom. Presented on the first floor gallery of 6 Burlington Gardens, the exhibition will be on view from 25 September to 24 October 2015. Wadden creates his paintings by weaving geometric forms that he then stretches over raw canvas, accumulating individual fragments into complete works that balance positive and negative space, textures and the materiality of the canvas with the artist’s woven forms. Influenced by First Nation, folk and Bauhaus textiles as well as painting movements such as Abstract Expressionism, Wadden complicates hierarchies of media and disciplines with his work, throwing the distinction between high and low into flux. For his exhibition at Pace, the artist has created a new body of five works that respond to the scale of the gallery at 6 Burlington Gardens. The works initially appear as hard-edged, two-tone abstractions, but close inspection reveals an intricate matrix of colours and textures as well as interplay between the warp and weft of the canvas as well as that of the artist’s own weavings. These subtle variations stem from Wadden’s reliance on second-hand and leftover fibres; as he exhausts one supply while working, he begins working with another of a different nature so his works become composed of an array of acrylic, cotton and wool. Wadden’s attention to texture and weave reveals the depth of Agnes Martin’s influence on his practice. Like Martin, Wadden recognizes canvas not only as a support surface but one that has tactile qualities that affect the composition. His paintings embrace the warp and weft of the canvas’s threads, playing them against the surfaces he has woven himself. Wadden’s turn toward labour-intensive methods and techniques situates him within a group of artists who have resisted technology in favour of more physical, craft-based media. He sees his paintings as accumulating the residual energy of his materials, his labour and the different categorical translations that happen as he transforms raw craft material into a painting. Rather than reject the distinctions between textile and painting, craft and fine art, he embraces each, weaving them into his own aesthetic that resists fixed boundaries between media. 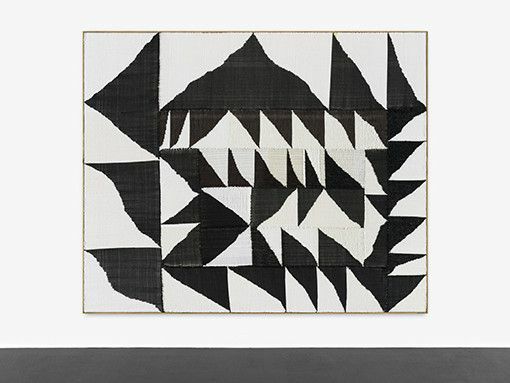 Brent Wadden (b. 1979, Nova Scotia, Canada) graduated from Nova Scotia College of Art and Design in 2003 and lives in Berlin. Solo exhibitions of his work have been presented at Peres Projects, Berlin (2013, 2014); Sorry We’re Closed, Brussels (2013); Almine Rech Gallery, Brussels (2014); and Mitchell-Innes & Nash, New York (2015). In January 2016, the Art Gallery of Alberta in Edmonton will present The Grey Area, the artist’s first solo museum exhibition in North America. Pace is a leading contemporary art gallery representing many of the most significant international artists and estates of the twentieth and twenty-first centuries. Founded by Arne Glimcher in Boston in 1960 and led by Marc Glimcher, Pace has been a constant, vital force in the art world and has introduced many renowned artists’ work to the public for the first time. Pace has mounted more than 800 exhibitions, including scholarly ones that have subsequently travelled to museums, and published nearly 450 catalogues. Today Pace has nine locations worldwide: four in New York; two in London; one in Beijing, one in Hong Kong and a temporary space in Menlo Park, California. Pace London inaugurated its flagship gallery at 6 Burlington Gardens in 2012.